I currently have 2,113 pictures on my iPhone’s camera roll from the past year but as of yet, I haven’t printed a single one. I have pictures of my baby nephew, the five weddings I went to, hen dos, family days and night outs with my besties that will be stuck in my phone forever unless I do something about it. I’m thinking of creating some kind of massive DIY display where I have photos clipped onto string behind a frame that I can constantly update. If I do make this, I might even turn it into a DIY blog post for you. 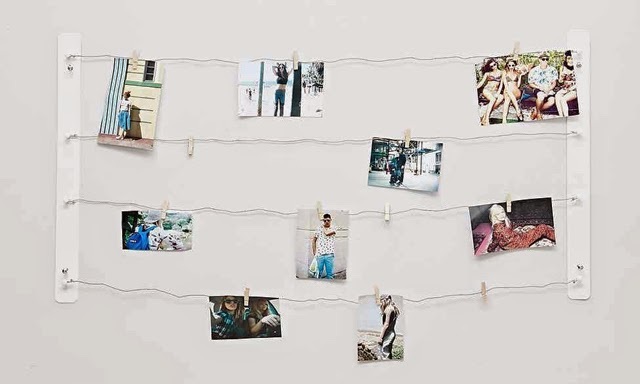 This Balvi Laundry Line Phot Frame from Urban Outfitters is what I’m currently basing my idea on. I may only be 28 but I have the body of an 88 year old. Yes I do. It creaks, clicks and aches on a daily basis. I play netball and zumba, both of which keep me fairly (and I use that term loosely) fit but I’d like to learn some basic yoga moves so I can really stretch out my creaky bones and get some upper body strength at the same time. Who knows, it might help me relax and then I can yoga pose in front of a beautiful sunset. At the moment all blog snaps are taken on my trusty little phone while I save up my pennies in the hope of eventually buying myself a proper grown-up camera. In the meantime I’m looking at buying different boards for backgrounds, learning about lighting and reading all the tips and tricks I can get my paws on. Got any for me? Share in the comments below. Now while I already have a reputation for honking like a small donkey when I laugh, I don’t think I do it enough – although I believe some will disagree with this. It’s my aim to laugh, hard, every single day in 2015, through the good times and the bad. So I’ve started 2015 by purchasing a planner for my blog posts. It’s a goody as it has all dates of the month laid out on single pages, allowing me to list all posts for each month. It then also has a daily breakdown with extra space for notes, so I can jot down what pictures I need and whether my social posts have been scheduled or not. This year I hope to blog more and have some cool new feature ideas I’d like to run. Fingers crossed.